One of the selling points of Chairman Camp’s tax reform proposal is the simplification of moving to two brackets with an additional ten per cent “surtax.” Sometimes this is styled as three brackets, but given that the surtax has a different base, this isn’t completely appropriate. However, discussing brackets alone gives a very inaccurate picture of the marginal tax rates that people actually deal with. There are many tax credits and deductions to keep track of, and in total a taxpayer faces a battery of over a dozen marginal rates. 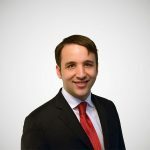 Chairman Camp’s proposal makes an effort to lessen the total number of individual tax expenditures, and to make sure those expenditures phase out in an orderly fashion. Nonetheless, the end result is still quite jarring. 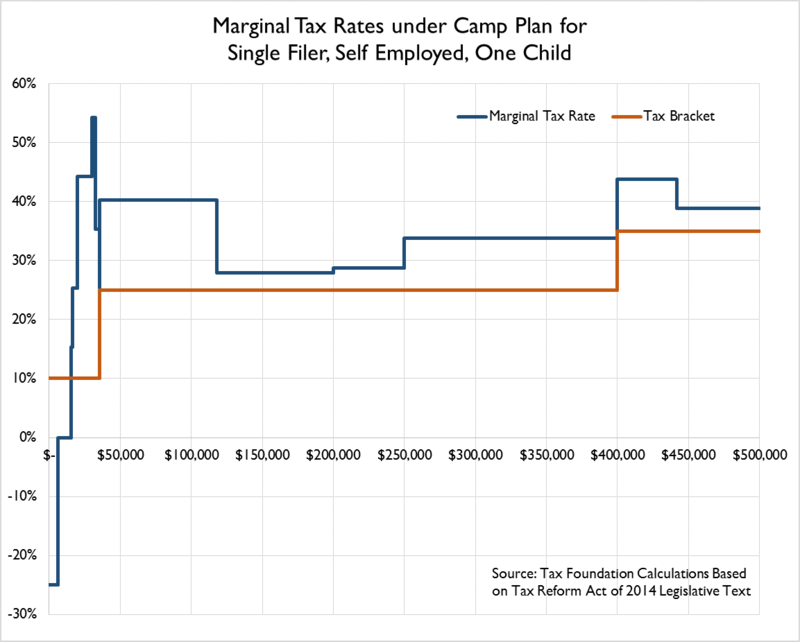 Here is a summary of the marginal tax rates faced by a self-employed single parent with one child at different levels of income. $0-6,000 10% -25% Child Tax Credit refundable to 25% of income. Other taxes canceled out by deductions and EITC. $6,001-15,686 10% 0% Standard deduction and EITC cancel out income and payroll taxes. $15,687-16,500 10% 15.3% EITC fully phased in, payroll taxes (15.3%) no longer canceled out. $16,501-20,000 10% 25.3% Standard deduction and “additional deduction” fully phased in, income tax now applies toward marginal rate. $20,001-30,000 10% 44.3% Earned Income Tax Credit phases out at 19%. $30,001-32,631 10% 54.3% “Additional Deduction” for single filers with at least one child phases out. $32,632-35,500 10% 35.3% EITC fully phased out. $35,501-35,600 10% 25.3% Additional Deduction fully phased out. Only income tax (10%) and payroll tax (15.3%) have effects at the margin. $35,601-117,900 25% 40.3% Move into 25% bracket. $117,901-200,000 25% 27.9% Social Security payroll tax no longer applies. $200,001-250,000 25% 28.8% 0.90% added to Medicare payroll tax from PPACA. $250,001-$400,000 25% 33.8% Tax savings from 10% bracket and Standard Deduction are phased out sequentially at 5%. $400,001-$441,800 35% 43.8% 35% bracket. Tax savings from Standard Deduction and Child Tax Credit phased out sequentially at 5%. $441,801+ 35% 38.8% Income taxes (35%) and Medicare payroll taxes (3.8%) apply. Many of the complexities associated with Chairman Camp’s plan are in fact legacies of the current tax code. If anything, the Camp plan reduces complexity in several areas. Nonetheless, this exercise should be a reminder that brackets aren’t everything, and that the tax code has a lot of hidden marginal rates that only become apparent if one digs through the details. It would have been more praiseworthy for Chairman Camp to go further in his efforts to simplify the code.